Advance reservations required • Same day pickup for additional fee • Call ahead and save. We may have another passenger traveling to your destination. If you can flex your departure time to a shared shuttle, we will lower your fare. CALL US! Help us be on time! OUTBOUND: Call 1-hour before your pick-up time. INBOUND: Call before boarding - Let us know your plane's on time. — Call 507-339-1651 to make a reservation. — Same day pickup possible. $20.00 Additional fee. Call ahead for reservations and save!There�s an economy to sharing a ride, and we pass the savings on to our passengers. First Choice Shuttle is the best value in personal transportation from the south metro to most of Southern Minnesota. Call and see how competitive we are to-and-from Austin, Albert Lea, Blooming Prairie, Dodge Center, Mankato, Rochester, Waseca and towns in between. Due to the current volatility of fuel prices, the fares listed on this website are subject to change without notice. We are absorbing as much of the price increases as we are able. We are commited to reducing shuttle fares as fuel prices return to former rates. 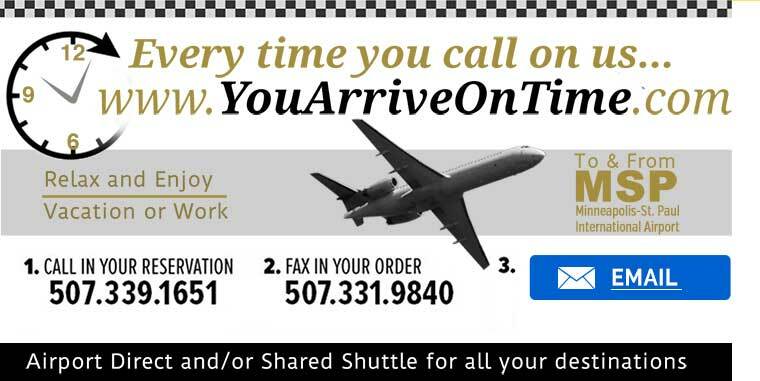 Thank you for using First Choice Shuttle transportation services.